Being able to make great things using your sewing machine is exciting and fun, but anyone seriously passionate about sewing wouldn’t want to limit themselves just to that. Also, when it comes to professional sewing, you just can’t rely on a basic sewing machine for everything. And that’s where a serger comes in. It does things that sewing machines typically don’t, and goes a long way when you’re working on something that needs to be top notch, and absolutely professional quality work. Making seams and doing high-quality edge and finishing work are some of the important tasks a serger will allow you to work on. But what are the best sergers on the market? Let’s find out below. There’s a reason pretty much everyone that bought this serger is all praise for it. It’s a professional quality serger that can do everything you expect it to, and a lot more. However, its price certainly doesn’t reflect that, as it’s one of the few sergers on the market that allows you to do professional quality work while making things surprisingly easy for you, but without costing an arm and a leg. Many sewers that have been sewing for years or even decades don’t get a serger, simply because they think it’s too intimidating to use. And they are not far from the truth, as most of them are. Not the MO-654DE though. The threading is as easy as it can get for a serger, and if you have been threading a sewing machine for a while now, you likely wouldn’t have any problem at all. It also doesn’t require you to make a ton of adjustments after threading, which most other functional sergers do. It also allows you complete control over the serging process, thanks to the pressure foot being very versatile. It lets you work as slowly or as quickly as you want. The quality of work it does would probably blow you away, especially if you have never used a good serger before. It makes stitches that are very strong, and would never come apart easily. This is also the best serger machine in terms of durability, as all the important parts are made using high-quality metal, and no cheap materials are used. You can safely assume that it’s going to last you for a very, very long time. A particular customer mentioned in their review that they are into professional costume designing, and the MO-654DE works great for their needs. It allows them to produce very high quality work while taking a lot of challenge out of the otherwise demanding serging process. Finally, it’s also much quieter than most other sergers you can find on the market, as many of the serger reviews about it mention. Well, it’s simply the best serger out there, for both experienced users and those new to serging alike. It’s a very functional, durable and powerful serger machine, and makes it very easy for users to produce professional quality work without letting things get complicated. It also comes with many useful accessories, so it’s actually priced much more affordably than it might seem. It’s not only one of the best sergers, but also the most popular ones. And it too has managed to get almost universally positive reviews. It’s a much more budget option though, but doesn’t demand much of a compromise on the functionality. It’s versatile in the sense that it can be used for many different types of projects such as home décor, finishing and more, and it would still maintain a great level of efficiency. 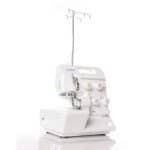 The versatility is further enhanced by its ability to work with either 3 or 4 threads, allowing you to use it in a similar way as another overlocker sewing machine here. It’s also a very fast serger sewing machine, and can sew up to an impressive 1300 stitches per minute. If you’re into heavy duty serging, this would save you a LOT of time. The adjustability is also great, as you can adjust it for different stitch widths as well as for the type of sewing fabric you’re using. In fact, it has a few different types of stitches you can use, which again adds to its versatility even more. Now, there’s just one thing we didn’t really like about this serger sewing machine. You need to oil it before you can start using it. However, this isn’t really a problem, but the fact that you’re told about this on page 57, which obviously isn’t where such an important piece of information should be. But it shouldn’t be a problem if you’re reading this, as you can also find how to oil a sewing machine here, and the steps would be more or less the same for a serger as well. The great value for money it offers is what we like the most about it. It’s priced very affordably, making it the best serger sewing machine for those on a budget. It’s very functional, comes with many different types of stitches, and most importantly of all, amazingly versatile. If you tend to work on a wide variety of projects, the 1034DX would be right up your alley! First things first, as the name clearly mentions, it’s one of the most portable sergers out there. It’s fairly compact and weighs considerably less than most other products. However, the portability doesn’t take anything away from its ability to do a great job as a serger. 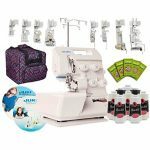 In fact, it’s a very heavy duty serger, and many of the surger sewing machine reviews for this product mention how it can sew through several layers of heavy fabrics like vinyl or even a heavier upholstery fabric. Similarly, a particular serger sewing machine review also mentioned how the MO644D sews very efficiently with no skipped or jammed stitches, which is very relieving given how frustrating this issue can be with some of the other sergers. Another one of the serger sewing machine reviews talked about how they have been using a Brother sewing machine since the past 4 years, and decided to take their apparel sewing to the next level with this serger. And it has been helping them do exactly the same. In other words, if you’re someone who is looking to move beyond just generic sewing projects, then this serger will be a great companion for enhancing your sewing skills further. Despite being priced very affordably for a heavy duty, portable serger, it’s very durable, with the parts being of a very high quality and long-lasting. It’s a very powerful serger that can sew through multiple layers of heavy fabrics like a thick quilting fabric or even a barkcloth fabric with ease. It’s also much more efficient than other cheap serger machines, and would take all the annoyance out of heavy duty serging. There are also many other features that add to both its overall versatility and functionality, making it just as good as a professional sewing machine for overlock stitching. 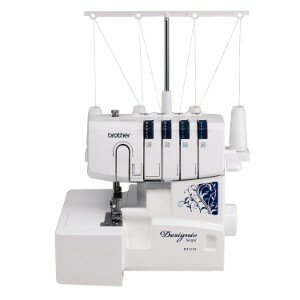 The Brother DZ1234 is one of the most feature-packed serger sewing machines with a surprisingly cheap price tag. It comes with lots of useful accessories and will allow you to start making high-quality, customized designs right out of the box. There are also more than a few Brother serger reviews that talk about how easy it is to use, and even users that have never used a serger before are being able to use it without any issues whatsoever. It comes with 3 additional feet, meaning it will be able to do a lot more for you than other sergers in this price range. The threading is stupidly simple, as each step of the process is marked and coded with colors, and there are also small pictures with numbers on the looper area. It’s also surprisingly easy to use this serger for overlocking. Similarly, in one of the serger machine reviews for this product it was mentioned that the customer managed to sew through as many as 4 layers using this serger, which is quite impressive given the price it’s being sold at. The differential feed works great as well, preventing any kind of stretching, which again takes a lot of frustration out of the process. With just some minor adjustments, you will be able to make amazing seams no matter the kind of fabric you’re working on, including even something like the batik quilting fabric. As we said above, there are a lot of other useful features as well as many accessories, but without going into them all let us just mention that it’s a great machine at an amazing price. The only downside is that the thread spools that come with it are very low quality and useless so you will have to purchase new ones separately. The DZ1234 offers an amazing bang for your buck. While it’s very beginner-friendly, it comes with a long list of great features that make it amazingly functional, as all those serger machines reviews mention. 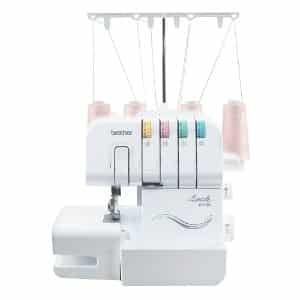 The threading is extremely simple, and some of the other features make creating perfect seams and the overall process very convenient and frustration-free, which is more than what you can ask from a serger priced so low. Here’s another budget serger that makes it to our list due to its great functionality and the value it offers. 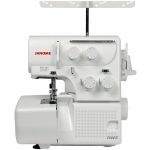 As some of its Janome serger reviews mention, it turns out to be good enough as a serger machine unless if you’re into professional sewing. However, you would still very well be able to produce things that have a professional feel to them, without having to deal with the usual annoyance of working with a cheap serger. A particular Janome serger review mentioned that it’s so easy to use that it’s recommended eve for children and for people with arthritic hands. This actually also makes the 8002D a great choice for kids that have gotten familiar with a sewing machine for kids and now want to get into serging as well. Coming to some of the technical details, the 8002D makes great seams. It also works particularly well when doing edges, which is not something all sergers can handle well. It also comes pre-threaded, so you will be able to use it right away and will be saved from the hassle of threading it for a while. The threading isn’t difficult with this serger either, although it can be a bit time consuming until you get used to it. Finally, it’s not completely quiet; but it’s fairly quiet, especially compared to the other sergers in this price range. It’s one of the essiest sergers to operate, and even comes pre-threaded. However, the functionality is definitely there, and it allows you to do great work on the edges as well as make seams that are neat and strong. How We Chose the Best Serger? How easy it is to thread (it can certainly make life difficult for you if it isn’t easy enough)? How good is its overlocking or chainstitching capability? There are some factors as well, which obviously also includes the price, but the ones we listed above are some of the more technical, more important ones. Some of the top rated sergers on the market come out a winner with respect to all these factors, which included the ones we reviewed in this post. We also consider the serger reviews 2018 to be sure that a particular serger is still getting positive reviews despite many new models having hit the market. Unlike something like sewing essentials or even perhaps like other machines such as a mechanical sewing machine, there’s actually nothing like different “types” of sergers. While they can differ from one another quite a bit when it comes to the overall functionality and ease of use, they are generally all of the same type. Sure, just like you have different brands in sewing machines like a Brother sewing machine or other less popular ones like a Juki sewing machine, you do have pretty much the same brands offering sergers as well. However, while a Brother serger is known for its superior functionality, a Janome serger is praised for the great ease of use it offers, coupled with a solid build quality. 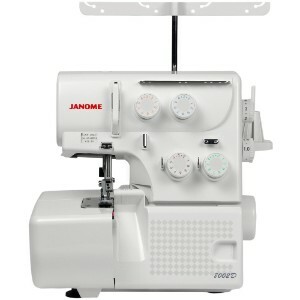 This shouldn’t come as a surprise though, as even a Janome sewing machine is known for its excellent durability. That all being said, although there aren’t exactly any different types of sergers, some factors to differ significantly which is something to take note of. For instance, some sergers are much more portable than the others, which make them ideal when setting up a small sewing room as against a very large one. However, you will probably only be able to learn about these important differences (that can otherwise be easy to ignore), if you spend some time understanding important sewing basics like the ones you can find on our sewing help page. Why You Need the Best Serger? Serging can be more challenging than you can think. 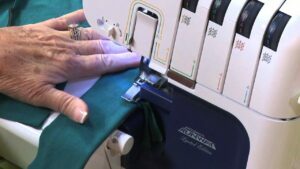 Using a serger is far different than using a sewing machine, or even a computerized sewing machine for that matter, which is the reason even sewers with decades of sewing experience stay away from serging. However, the best serger can make this otherwise extremely complicated and challenging task of serging surprisingly easy, convenient and frustration-free. And once the frustration part of serging is gone, it will actually turn fun and exciting, as your sewing possibilities will expand beyond your imagination. Making perfect, professional quality seams and doing excellent work on the edges will no longer be something only the professionals you follow on their blogs can do… you will very well be able to do these tasks just as well yourself. And you don’t even have to go for the best serger for the money to be able to do this. Of course, if the budget is not a problem for you, you will be able to get the very best machine there is out there, but even if you would like to stick to a budget, there are still many options out there that can turn out to be just as good for you, depending on your needs and preferences.